The Takamine LTD-2004. A design pulled from the stars, Bob's most elaborate inlay design to date represents actual constellations with their mythological figures. Made of over 134 individually inlaid pieces of exotic woods, Corian and acrylic mirror, this rosette design depicts the constellations, Draco the Dragon and Ursa Major the Great Bear, which encircle the north star. The inlaid constellation stars are correctly positioned as in the sky. The dramatic interaction of the mythological figures is Bob's own original interpretation - a tribute to the artistry of ancient star charts. Even the round soundhole label inside the guitar continues the constellation 'map', with the north star marking the center. 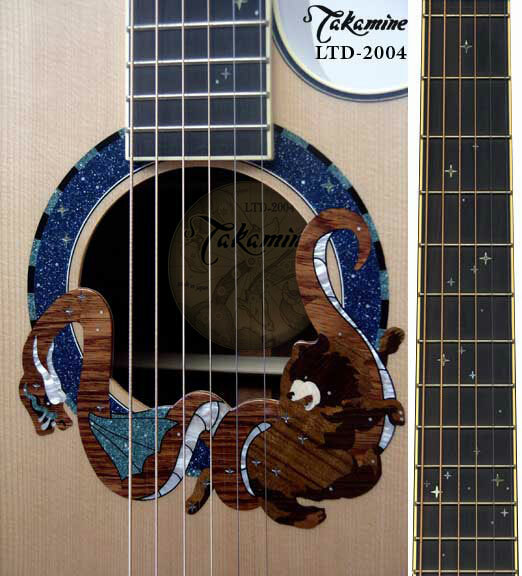 The guitar's frets are marked by a gentle swirl of stars across the fingerboard.